A news coordinator at Western Illinois University is being recognized for outstanding work in journalism. Jasmine Crighton has always had a passion for journalism. She started writing for her college newspaper as a student, which laid a foundation for her in the news world. Crighton jumped into the production side of the business following college, where she worked as a production assistant in grad school. She climbed the ladder and worked her way up to assistant director. Her last stop before joining the Macomb community was Steubenville, Ohio, where she was a news producer. Crighton brought her Emmy award-winning talent to Western, where she has been supervising NEWS3 for the last six years. In addition to supervising, Chrighton is also an instructor in Western’s awardwinning broadcasting and journalism department. Crain’s NewsPro magazine has selected 10 individuals for its “Outstanding Journalism Educators” of 2018. Crighton put a lot of effort into the news program leading up to this recognition. She also wasn’t afraid to mix the routine up; she changed one of the newscast days. Crighton didn’t waste any time-sharing her knowledge on what makes a worthy news story to students in her classes and those looking to work on the NEWS3 team. “When I came to WIU, I asked my students to work news beats, go out into the community, and cover issues important to the area,” Crighton said. Encouraging students to explore stories that interest the public is a priority for Crighton, but there is much more to the job. 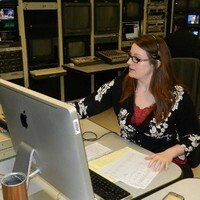 She assembled a news production staff from teaching a studio production class, which she created after coming to Western. All of NEWS3’s producers were or are in one of Crighton’s classes. She says this process allows her to increase the stability in the newsroom, which is comprised of student directors with vast experience. Students who hope to receive or retain positions at NEWS3 must apply or reapply each semester. Crighton also holds auditions for talent positions on the station. She is dedicated to offering the highest possible quality of content. “I’ve always thought it’s very important to tell the stories of people who can’t always tell them for themselves,” she said. William “Buzz” Hoon is a College of Fine Arts and Communication Associate Dean at Western, and is very familiar with Crighton’s work. Hoon nominated Crighton for the award noticing her continuous impact. “We are successful in part because of the teaching, service and extra effort Jasmine provides to our students on a daily basis,” Hoon said in an interview with Western Illinois University news. The magazine can’t list everyone involved, but Crighton believes those at NEWS3 should be aware of their success.